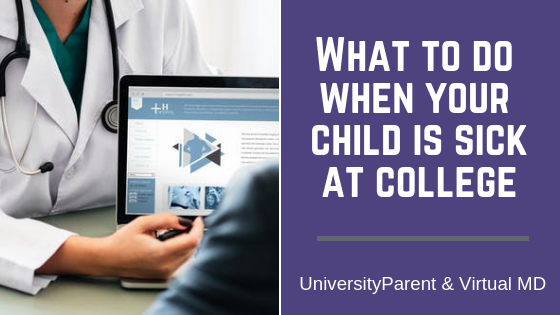 Parents of college students often feel helpless when their students are sick and away at college. They want to help, but they’re not sure how when they’re so far away. If it is their first time away from home, students may feel extra homesick when they’re sick. While you can’t be there physically for them, you can be there to listen to them and make helpful recommendations. Ask about your son or daughter’s symptoms, and ask about what they’ve done to treat it so far. Does it sound like a cold? The flu? Something more serious? 3. Encourage your child to seek medical advice. 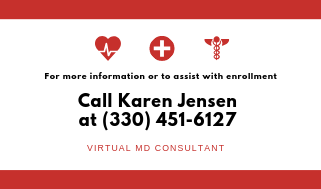 When your child is sick, one way you can help is to provide them with a subscription to Virtual MD, a telemedicine service. Even though you may have insurance, your student is busy and most don’t have time to go to the emergency or wait for an appointment – so they just don’t go and they get sicker! Telemedicine provides a convenient way for your student to obtain an immediate diagnosis and treatment plan right from their computer, smartphone, or tablet. Your student gets the care they need, and you can have the comfort and peace of mind knowing your student is being cared for by U.S. Board Certified doctors as soon as they are sick – Your student never has to choose between their wellness and what’s convenient again. After the initial enrollment, your student can use their computer, smartphone, or tablet to connect with a certified doctor in 20 minutes or less. The doctor will discuss the treatment plan and call in a prescription (if needed). Your student is going to receive the exact care they need, exactly when they need it. 4. Send a “Get Well Soon” care package. Here are recommendations to send in a care package when they’re sick: vitamins, peppermint tea & honey, basic cold & flu medicine, cough drops, dehydrated soup, antibacterial wipes and hand sanitizer, ear plugs, and a sleep eye mask. 5. Have Chicken Noodle Soup delivered. 6. Encourage hydration and a healthy diet. 7. Remind your student to notify their professors if they miss a class. Your son or daughter may be used to relying on you to contact their teachers in high school if they’ve been absent, but now it is up to them to handle on their own. 8. Talk with your student about how much they’ve been sleeping. Are they pulling all-nighters to study? Have they been able to create healthy sleep habits? Poor sleep habits can have serious consequences for students, and college students are notorious for not getting much sleep. 9. Address signs of stress early. College students must deal on their own with the stress that results from demanding coursework, finances, campus jobs, relationships, changing values, and much more. Here are several ways to help from a distance. 10. Check in with her about mental, emotional and physical well-being. If you notice signs of chronic issues, encourage your son or daughter to seek professional counseling. How Do I Talk to My Student About Staying Healthy in College?